As I documented here, I had located a marriage record for Gottlieb August Zierke (1833-1879) and his wife Wilhelmine Sommerfeldt (1835 – 1912). They were from Posen, Prussia and settled in Princeton, Marquette County, Wisconsin, arriving in June of 1858.
in written form, mother-of-bride in verbal form. Banns:  10, 17, 24 January. Siebenschlößchen means “Seven Small Castles”, and is located near Dziewoklucz Poland – about 5 miles south of Margonin, the town where the marriage was recorded. There are still buildings at that site, visible on Google Maps, but the town doesn’t have a name shown there. 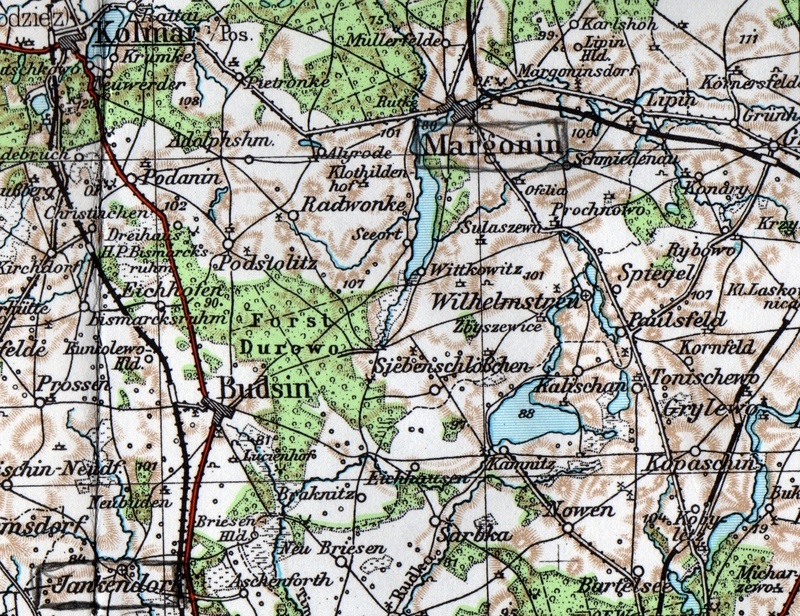 The distance between Podstolitz (where my 3x great grandmother Wilhelmine Schulz and her brother Martin were born) and Siebenschlößchen is only about 5 miles. This map shows the relative locations of Podstolitz and Siebenschlößchen. Podstolitz is just north of Budsin. Siebenschlößchen is just east of Budsin. This entry was posted on Sunday, March 17th, 2013 at 5:13 PM	and posted in Zierke. You can follow any responses to this entry through the RSS 2.0 feed.